The Dead Sea is only a two-hour drive from the center Tel Aviv, and well worth the journey. 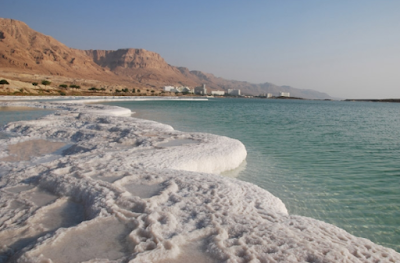 The Dead Sea area has enormous historical and religious importance, and is also renowned for its therapeutic attributes sue to its high mineral content. These unique properties make it a favorite destination for relaxing spa treatments and mud baths, and the top Dead Sea attractions should not be missed during your stay. The Dead Sea has played a vital role in history, and it’s great to spend a day visiting the old sites. Jericho is located to the north, and was the site of the cities destroyed in the Book of Genesis during the time of Abraham. Of the groups of Jewish people who took up residence here, some of the best known are the Essenes of Qumran. This community left behind the Dead Sea Scrolls, a collection of documents that contains pieces from every book of the Old Testament and offers fascinating insight into the social and religious beliefs of 1st-Century Jewish people. The Dead Sea Scrolls were discovered in the Qumran Caves, which have been turned into a very popular national park and are just one of many can’t-miss Dead Sea attractions. As a destination, the Dead Sea is unique because it’s the lowest place on earth. According to Islamic tradition, the people who lived in the region were wicked, and Allah sent three angels to test their virtue. When they failed, the angel Jibrail raised the land and flipped it over, causing it to crash and collapse in on itself. Thus, the lowest place on earth was created as punishment. In modern times, the Dead Sea is a fabulous place for its poignant atmosphere and relaxing activities. If you find yourself overwhelmed by the sheer power of the Dead Sea’s religious and historical significance, calm your nerves by dipping into its healing waters. Visitors have many options, ranging from 24-hour public beaches to swanky Dead Sea resorts. If you’re just passing through or you have many other Dead Sea attractions to visit, consider stopping by Mineral Beach for a quick dip in the high-salinity waters. The beach is well cared for, and it also features a freshwater pool for children and a spring-fed hot sulfur-water pool. The shore is lined with natural mud, supplying the perfect natural products for a rejuvenating mud bath. When you’re finished, you can rinse off in the showers that are provided for general use. Naturally, the list of Dead Sea attractions includes many wonderful spas. The famous Ein Gedi Spa offers private beachfront access, indoor thermo-mineral pools, and a large bath filled with mineral-rich mud. The spa also operates a treatment center, where guests can enjoy massages and other relaxing luxuries. Neve Midbar is another popular spa location on the Dead Sea. Open 24-hours a day year-round (except Memorial Day and Yom Kippur), this location offers the usual beachfront access and therapeutic treatments, as well as a restaurant, lounge, and affordable lodging options. Neve Midbar provides 14 straw huts for overnight stays, as well as camping areas for people who bring their own tents. Because it is budget friendly, Neve Midbar is very popular amongst young tourists and locals. Khamam Tse’elim is another great spa option, and it is unique thanks to its small, intimate size. It features a whirlpool, dry sauna, and a treatment facility. However, what really sets it apart is its tourist center, which organizes trips in the nearby area that allow visitors to experience the hospitality of an authentic Bedouin meal. Few spas are able to combine history and relaxation in such a pleasing manner, and Khamam Tse’elim is a great way to combine these fantastic aspects of the best Dead Sea attractions. For visitors interested in enjoying the many Dead Sea attractions in style, there are numerous top-quality resorts from which to choose. Ein Bokek, located on the western shore of the Dead Sea, offers ten hotels, two beaches, and multiple therapeutic baths, as well as a solarium for skin treatments. Fattal, the largest hotel chain in Israel, provides a Dead Sea resort experience in the luxurious Magic Nirvana Club. This beachfront resort is all-inclusive, and it offers guests access to a private beach, onsite spa, health bar, and numerous other outdoor activities. If you’d like to experience the classiest aspects of the Dead Sea, a resort like Ein Bokek is the best option. The Dead Sea has played a monumental part in religion and world history. Today, it is a natural marvel, whose benefits are enjoyed by countless tourists. Learn more about spas in Tel Aviv.